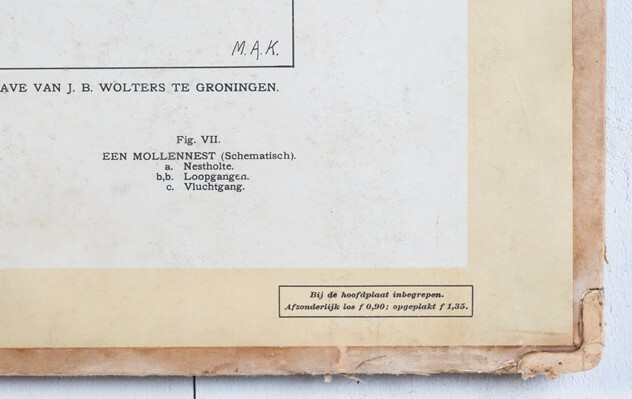 Here are three large (just over a meter wide) anatomical boards from the Dutch schooling system. The boards depict; 'Ruminants', 'Water and Grassland Birds' and 'Insectivores'. Each board has information to the base of the imagery and a strip of information to the rear (in Dutch). The images are very nicely detailed, with good colour. All are paper mounted on board, some of the metal corners for the boards are missing and the string that goes through the four upper hanging holes is missing from two of the three. There are light water marks and damage to the edges (see photos) but generally the boards are good and presentable. Each board measures 75.4cm high, 102.6cm wide and 0.5cm thick. They're priced at £55 each or £150 for the three.